We’ve Got Tonight is the tenth solo studio album by Kenny Rogers, released in 1983. It is also his last with Liberty Records before moving to RCA Nashville. The title cut, a duet with Sheena Easton, was the debut single and became one of Rogers’ signature hits, soaring to #1 on the country charts and #2 on the Adult Contemporary chart, reaching #6 on the Hot 100 chart. There were two other singles: “All My Life”, which peaked at #13 on the country charts, though it fared at #3 in Canada, and “Scarlet Fever”, which is lesser-known but still reached #5 and #4 in the US. and Canada, respectively. The title of the album comes from its signature track, written by Bob Seger and originating from his album, Stranger in Town. 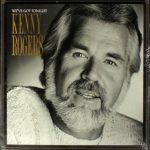 By comparison with Rogers’ version, Seger’s only reached #13 on the Hot 100, making Rogers’ version better-known, five years after it was written. One song on the album that never became a single but still became one of Rogers’ signature songs is the powerful “You Are So Beautiful”. This track was placed at the end of the album as a tribute to his legions of female fans, and stands today as one of the songs that Kenny is known for. The song was written by Dennis Wilson, Billy Preston and Bruce Fisher and originally appears on the 1974 Preston album The Kids and Me. Lionel Richie, who by now had been contributing a large number of songs to Rogers, submitted the track “How Long” to this album. The album hit #3 on the country charts and #18 on the Billboard 200 charts. Despite lower rankings than many of his earlier releases, the album was still certified platinum in both the US and Canada.